1. Our silicone bottles flexible, so you can squeeze out every drop. 2. No leaks and that is what you was looking for in a travel bottle. 3. The jar and mini scraper, reusable Plastic Jars to Store Creams, Salves etc. 4. The sprayer can store air fresheners, insect repellents, toners, makeup and Fragrances sprays to travel. 5. BPA free and Food safe soft silicone material, usable for lunchbox for salad dressing, ketchup/mustard etc. 6. Hold more than a week's supply. We love to travel the most beautiful places in the world, we like nice things. And we're so sure that you'll love our travel bottles, we guarantee it for life. If for any reason you don't love your Chamch travel bottles, you feel free contact us, we'll give you a full refund. ☆ Do not overfill your squeeze travel bottle, this may cause the caps to not seal properly making the content inside to ooz out. Fill it up at least 3/4 of the desired liquid you want to put inside it, leaving room for air. ☆ Travel bottles are not workable for Oils, Alcohols, Hair Serums, Salicylic Acid, Hydrogen Peroxide, Caustic, Corrosive or Flammable products. ☆ The silicone bottle body can withstand temperature from -76℉ to 302℉. It is safe and efficient to sanitize it in boiling water. ▲ TSA Approved - The makeup bag will allow you to pack all your toiletries and be TSA approved. Perfect for airlines, cruise ships and all other forms of traveling, our silicone bottles are a must-have for your trips! ▲ Leakage Design - The leak proof air valve adopts food grade silica gel elastic film, can helps control how much liquid is squeezed out. The travel bottle cap is fitted with 3 leak-proof layers that will protect your luggage and package from leaking or spilling. 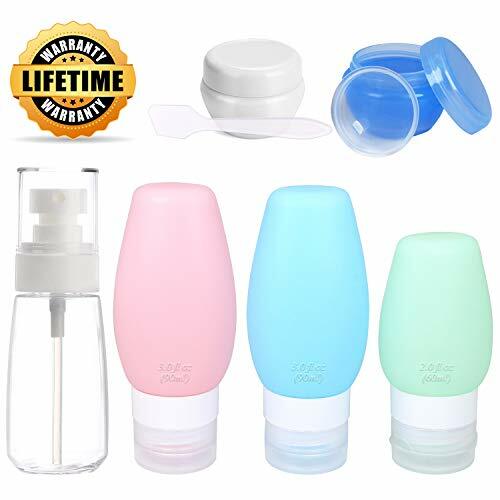 ▲ Easy to Fill/Squeeze - Our travel bottles have a wide mouth that makes filling them really easy, and it is so soft to squeeze and makes it easy to get every last drop of liquid out of the bottles. Easy to clean. ▲ High-Quality Material - FDA certified. super compression resistance, soft and not deformed, lightness, durability, wear-resistant, waterproof and no odor, so they won't crack or break while you're travelling.They can even withstand drops, meaning that you won't have to replace them very often! ▲ Convenient - Take it with you and go travel! Suit for swimming pool, trip, visit , hotel and so on. Being packed with a zippered clear toiletry bag, easy to carry . Package Contents : 3* Bottles， 2 * cream Jars, 1* spray bottle,1*mini spatula, 1* zipper bag. If you have any questions about this product by Chamch, contact us by completing and submitting the form below. If you are looking for a specif part number, please include it with your message.